i’m obsessed with mists, especially anything with rose water. i leave them by my bed, at my desk, keep a small one on my sink, etc. they instantly make me feel a bit more relaxed and fresh and relaxed. we thought it would be fun to experiment with different combos of scents and oils and make some for ourselves (since they can be pretty pricey when you have as many as i do!) we’re going to share a few of our favorite combinations below and we’re also going to share the label i designed so you can print them and make some on your own. 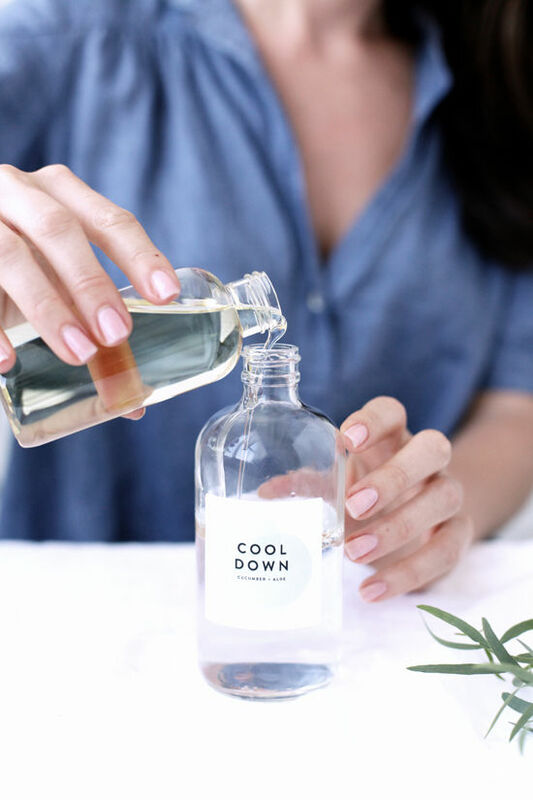 calm down: rose water + witch hazel – to make this, fill your bottle 1/3 of the way up with distilled water, slowly add three tablespoons of rose water and witch hazel. you can adjust this amount depending on preference. we added a little more rose water because i love the smell. cool down: cucumber + aloe – this combo is perfect for a in the sun. 1/3 cup distilled water, 30 drops cucumber seed oil and 4 tablespoons aloe vera oil. this one will separate so shake before using. sleep tight: lavender + orange – the verdict was mixed on if orange was relaxing or energizing but we liked the combo so much we decided to leave it. we used distilled water and then 30 drops of lavender oil and only 10 drops of orange. don’t forget to download the labels above and you can make your own as gifts! Though I won’t be making them myself (too lazy for that..) I really like using mist too! well done!!! OMGOSH – how cool – I love this!! This is super easy and anything to save a few bucks – I’m such a cheapie! and those glass misters are beautiful (and affordable)!! This is a fab idea, especially as I’m really feeling the heat at the moment! Lavender is one of my favourite smells in the world. Love this idea. Where did you find your bottles. They are adorable and look great with the labels. Never mind. I just saw that I could click the bottles for link. Sorry. absolutely gorgeous and such a great idea. where did you find those awesome bottles? I actually might do this. I imagine misting my face with fancy rosewater will make me feel super posh and important. Question: How do you know which essential oils are OK to touch your face? I have some from The Body Shop and the girl in the store said they really weren’t meant to be used for skin. hi stephanie! we read a lot about the different products and found that some oils, like lavender are not great to put directly on your skin. the ratio that we used with that spray is so diluted that the amount of oil that’s actually getting on your skin is tiny, if any. we also spray from a distance as these are designed to be more of a mist. other of the ingredients, like witch hazel, rose water, aloe and cucumber oil are great for the skin and provide toning, etc. this is so excellent. i want to do these as christmas gifts! Yes, yes, yes, everything about these is AMAZING! I have been making my own room/body mists and have thought about putting them up on etsy, but am a little less than pleased with using brown amber glass bottles. Where did you get those glass bottles? These are such a wonderful summer idea, I love face mists because they instantly make me feel fresher. 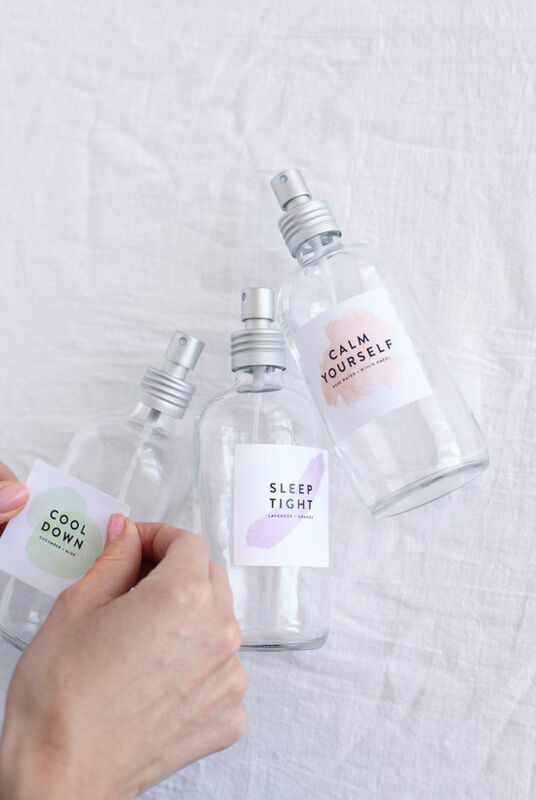 I absolutely adore the clean, minimalistic aesthetic of these bottles + mists as well! I was just about to invent this and then I saw it here- the rose water mist is what I am addicted to. Thank you! Oh my gosh I love this project! Such a fun summer diy. I am adding this to my to-do list this weekend. I love those beautifully designed labels. i admire how creative you guys are; thank you for sharing, this sounds great! Love these! Can’t wait to make them for some awesome gifts! Such a great idea! Cute and practical! 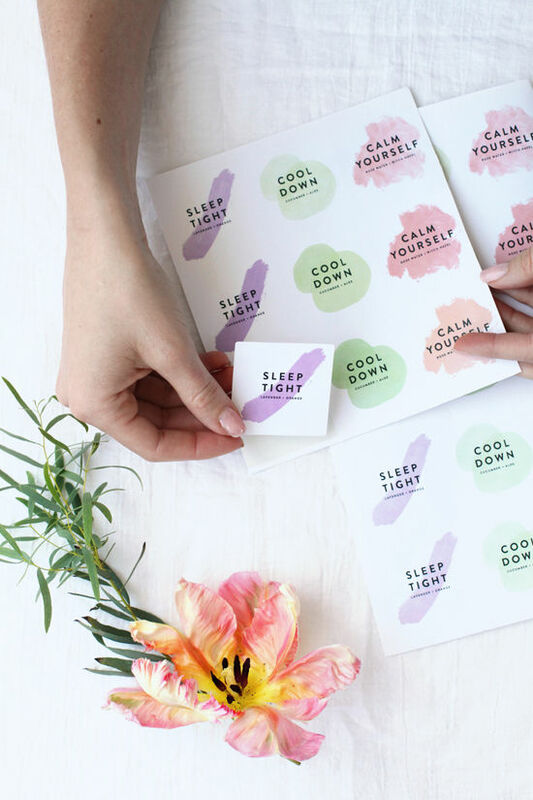 These would have been great for our recent post on http://www.casaandcompany.com about how to get relaxed before bed! 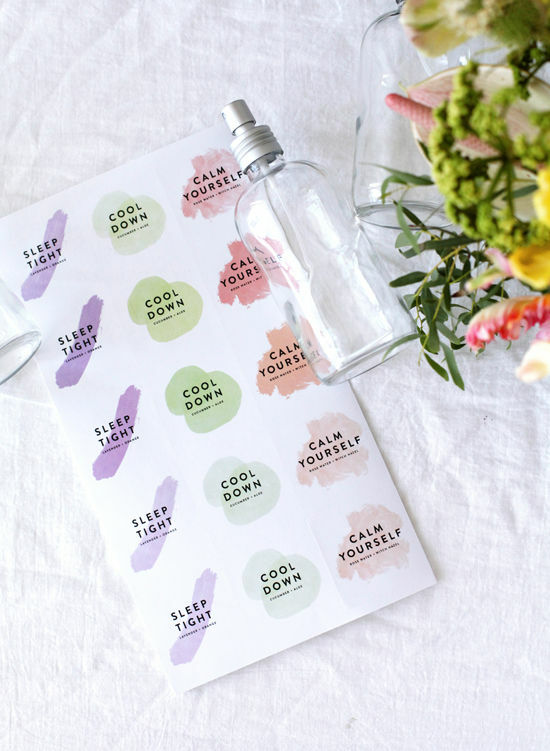 Love this idea, and basically all of your DIY tutorials 🙂 Which printing labels did you use? Thanks!! we just added the link to the labels in the “what we used” section! Where do you get the glass bottles from? For #9 comment – Lavender is perfectly safe to use, even neat (undiluted). Most essentiall oils should be diluted to a 2-5% solution for adults, 1% for children. Lavender is one of the few exceptions. It is, in fact, very healing and soothing for most skin ailments – we use it for rashes or welts, cuts and scrapes, burns, and stings and bites. The rest of the oils are all well-dilited in these recipes, so you shouldn’t have a problem u less you are directly allergic to that plant. LOVE this project and am attempting to make this weekend, but like Keri asked, where did you find the glass bottles you used? Trying to find ones like them and having no luck. Thanks! There are some strict conditions that must be met for an extramarital relationship. You will probably want to stay on Green for 95% of the game. some supplies from the side rooms. Quick questions: Do the bottles have to be glass? Where can I find bottles and ess. oils at? Thank you! This is a lovely idea! Nevermind! Sorry! But still a lovely post! Thanks so much! What a neat idea. Where did you purchase all the oils & ingredients? 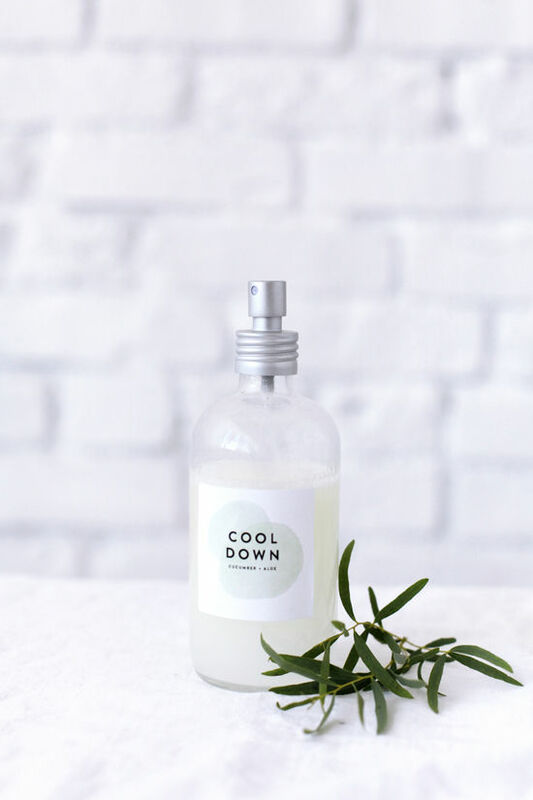 Hey there, I am going to make these as Christmas gifts, such a cute idea, where can I get the spray bottles from ?? I LOVE this idea!! 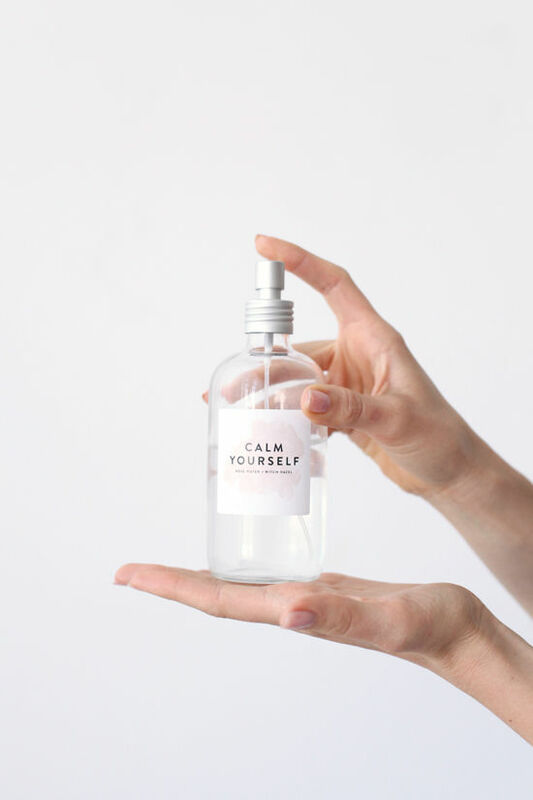 I plan on making these as gifts, but I was wondering if ya’ll had a recipe for an energizing mist? Or if you don’t have one formally written up, could you tell me a good combination of oils to use? Hey! The labels won’t actually match up with a standard 2″ label template when printed. Is there any way you can repost the images on a word doc in standard 2″ label template? Where in the world are these bottles? I’ve looked for them on numerous websites and no luck. HELP! Hey! 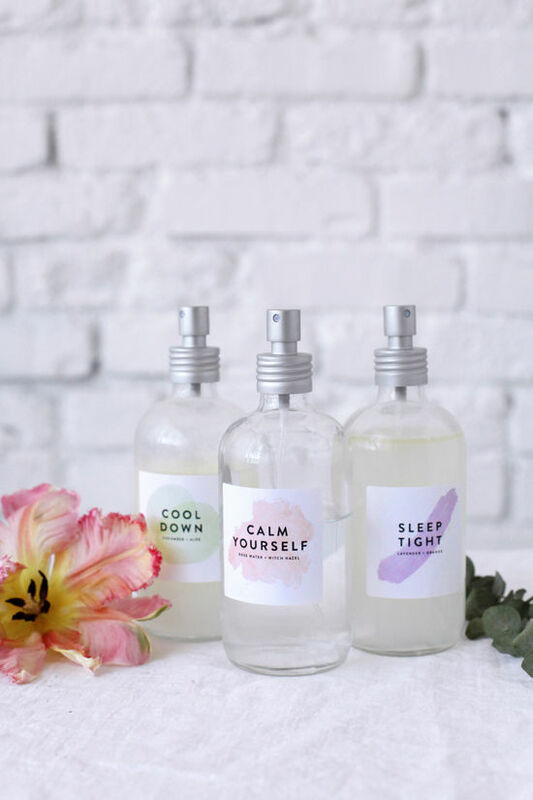 Love the mist recipes and the labels…I would also like to know where I can find these bottles?? can you use peppermint extract + distilled water to make some? hey everyone, you can find the bottles by clicking on the words “glass mist bottle” under “what we used”! Hi, I’m a bit late to this post, but would definitely be trying this! how long do the mists last? do we need to add any sort of preservative? 1. can I use sunflower oil to replace the cucumber seed oil? 2. for sleep tight, should I use purified water? or lavender water? thanks! These are so pretty! I’d probably leave the orange out since citrus is energizing for me, but I will definitely be trying at least one. Thanks! Hi; love this idea! 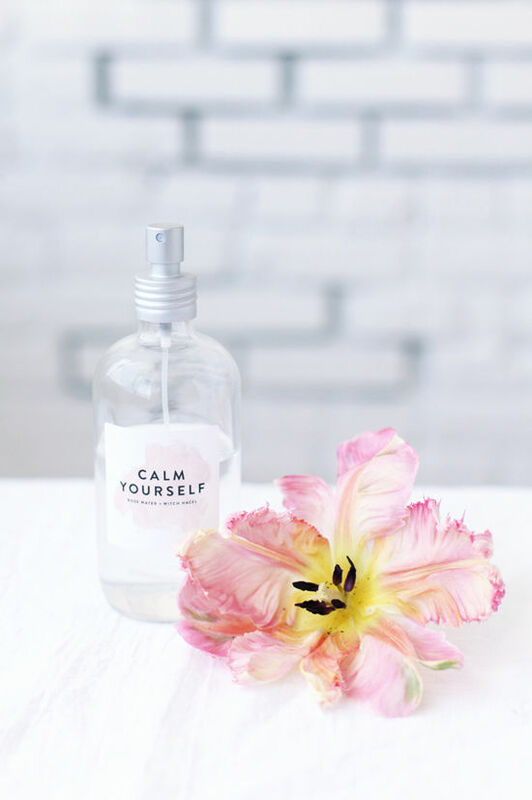 What are the shelf lives of these DIY mists? i would say about 9 months but honestly, we still use ours years later! Am wondering about the shelf life, if made with witch hazel the alcohol world be a preservative…. But the others have no preservative….,? Thanks. What is rose water, it is water infused with rose? I totally love your labels! I am trying to DIY my products and would like to find appealing containers. I love yours! Can you direct me to where can we purchase them please?